I’m a music lover who likes to create songs and share them on the internet. Now I intend to upload my song on a site which can only support 44.1 kHz, but my song is at 48 kHz. Is there any good and easy-to-use sample rate converter? Thanks for any suggestion. Don’t worry. Actually, there are many programs that are available to solve your problem. If you still can’t find any useful tools for converting sample rate of your songs, I would recommend you to Google VLC, Video Grabber and Video Converter Studio. They are the tools that I have used for many times and work amazingly. Short for VLC media player, VLC is a very popular free streaming media server and player. It can be used on nearly every kind of platform such desktop operating system, Android phone, Windows phone, and iOS phone. It not only supports various kinds of video, audio formats, but also supports converting between videos, video to audio and audio to audio formats. Have you ever used this tool to do sampling rate conversion? Before we start to use it, you first need to download and install it on your computer. Open it, click “Media > Convert > Save”. Click “Add” on the pop-up window to add the file that you need to convert. Hit “Convert / Save” at the bottom. On the next window, select the output audio format from “Profile” drop-down menu. Then click “Settings” icon next to Profile. Here you can set the codec, bitrate, channels, and sample rate by tapping the third “Audio codec” tab. According to your need, you can set the sample rate as 8000 Hz, 11025Hz, 22050 Hz, 44100 Hz, and 48000 Hz. And click “Save”. You can type your file name like this “song.mp3” and set destination directory from the “Browse” option. To trigger converting 44.1 to 48 kHz or other ones you like, simply click “Start” button finally. As its name hints, it allows you to grab videos from popular video sites including Vimeo, YouTube, Dailymotion and many more. Moreover, it can help you convert video to video, audio to audio and video to audio very simply. And it also facilitates you to do screen recording projects. Open Video Grabber on any browser that is available on your computer. Of course, this free online service requires you to connect internet before using. Click the second tab – “Convert Video”, hit “Select files to Convert > Launch application > Select file > Open”. Hit Format and check MP3 or other audio formats. 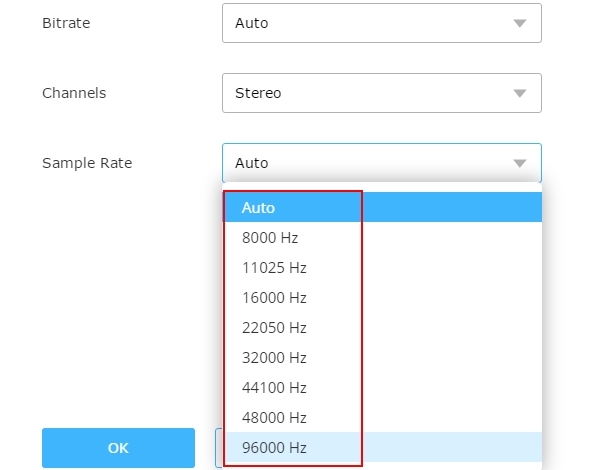 Click “Settings > Audio > choose sample rate as 8 kHz, 44.1 kHz, 48 kHz, 96 kHz”, etc. Hit “OK > Convert”. 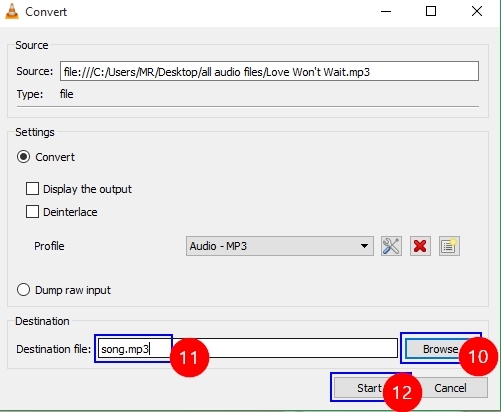 If you don’t like to use online service or find it a little annoyed to use VLC for converting files, try to use this powerful sample rate converter – Video Converter Studio. It supports converting any kind of audio or video format including MP4, AVI, WEBM, WMV, MOV, FLV, 3GP, ASF, MP3, OGG, M4A, AAC, etc to other popular or rare formats. Besides converting video or audio, you can also make some editing jobs like adjusting video effects (contrast, saturation, volume, and brightness), adding picture or text watermark, rotating, cropping, trimming and so on. Or if you have specified requirements for the output videos, it will help you a lot. Click Download button above and continue to install it on your PC. 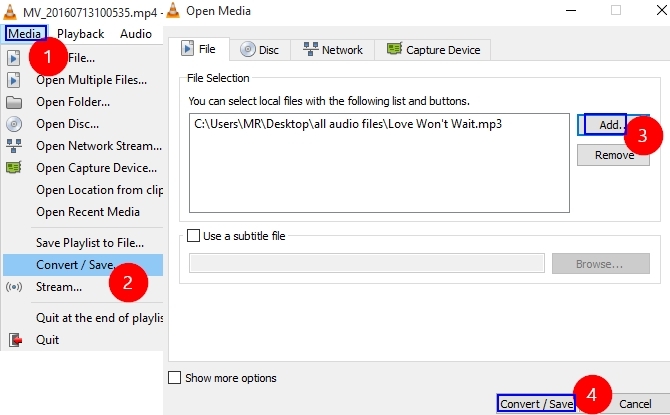 Click “Add files” button to load your file for converting. 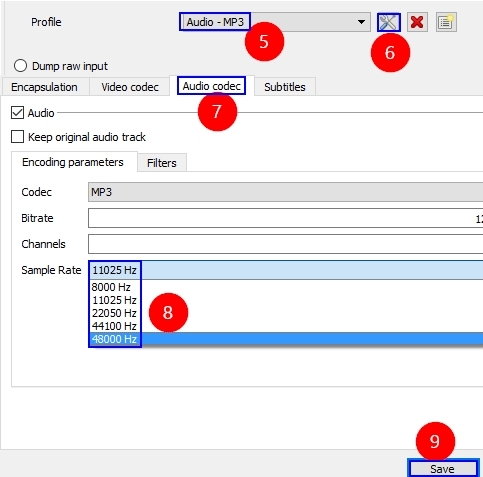 Select the output format as any available audio format you like from “Profile” drop-down menu. Click “Settings” to preset the sample rate. 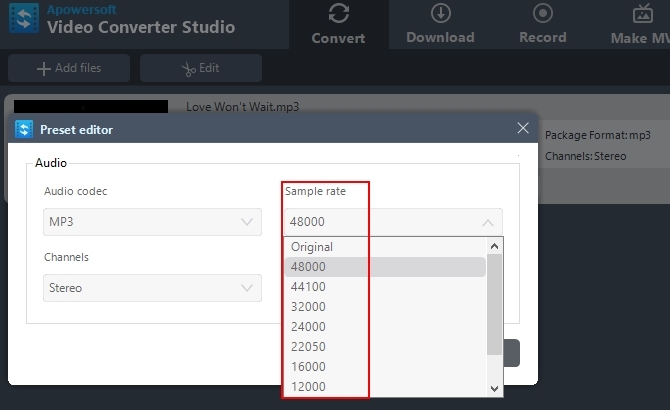 Tap “OK” and “Convert” to begin sampling rate conversion. Well, you are allowed to convert audio sample rate by applying one of the 3 above tools. VLC has many practical functions for processing media files, but its interface is out of date. Video Grabber is a very smart service for converting files, while it is not a professional tool. Comparing them to Video Converter Studio, you find this tool is much better based on its streamlined interface, fast speed for converting and other advanced functions. 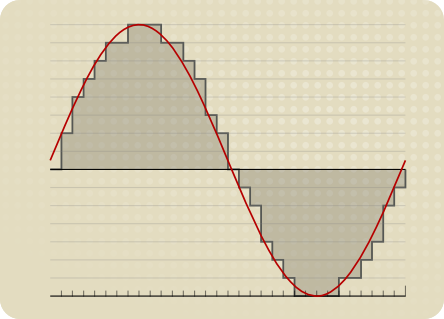 Sample rate, sometimes called sample frequency, is used to define the number of samples carried per second for audio file. The unit of account for measuring it is Hertz which is abbreviated as Hz. The sample rate includes the following types: 8, 11.025, 22.05, 32, 44, 48, 64, 88.2, and 96 kHz. The sample rate of CD audio is 44.1 kHz and the DVD audio is 48 kHz.